Pictures from the 1940s show a parade and children playing in Jayne Park during LaSalle Field Days. NIAGARA FALLS – Dust off the old family photo albums. 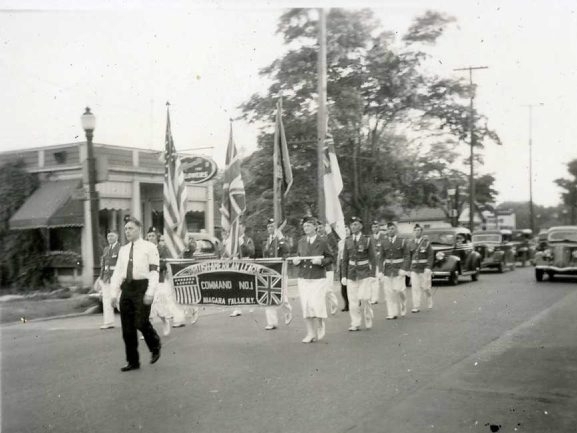 LaSalle PRIDE Inc. will present a lecture on “Agricultural Fairs and LaSalle Carnivals” at 6 p.m. Tuesday in the LaSalle Library, and organizers are looking for old photos and memories from these happy, earlier times. The group will meet on the second floor of the library, 8728 Buffalo Ave.
Teresa Lasher Winslow, an authority on the history of the former Village of LaSalle, will present a powerpoint presentation of the beginnings of Niagara County’s Agricultural Fair and its popular LaSalle carnivals. LaSalle, once a part of the Town of Niagara, became an official village in 1897, until it was annexed into the City of Niagara Falls in 1927. As an agricultural area in the Town of Niagara, LaSalle hosted agricultural fairs on the former Tompkins Brick Works property on 91st Street between Frontier and Read avenues, beginning in 1912. When the agricultural fairs moved to Lockport, the village continued with the annual LaSalle Carnival in Jayne Park on Cayuga Island until the 1970s. Today, a small version of the carnival still continues each June at St. John de LaSalle Catholic Church. Four generations of LaSalle residents found these events very special, and all are encouraged to attend Monday’s event and bring photographs and other memorabilia, which can be scanned and returned to the owners. Lasher Winslow believes the early agricultural fair was the precursor of the Niagara County Fair, which is held each summer in Lockport, but she is still researching the topic and always welcomes insight from the public. “I don’t know everything I need to know about it, and that’s the interesting part of my job,” she said. She said she has collected some memorabilia through the years, including a 1935 fair program cover and some early newspaper accounts. Winslow also has a number of fine photographs from the late Tom Quinn, who was a 1939 LaSalle High School graduate and took many photos of the area that have been shared by his family. “There are still many farmhouses and barns that still exist here, although people might not realize what they were,” she said. The History Committee of LaSalle Pride is hosting a series of lectures on the neighborhoods, waterways, schools and other historical topics throughout the year. For more information, call 283-3295 or 425-4005.